Stands of Casuarinas were planted after the Cedar Blight in the 1940's. 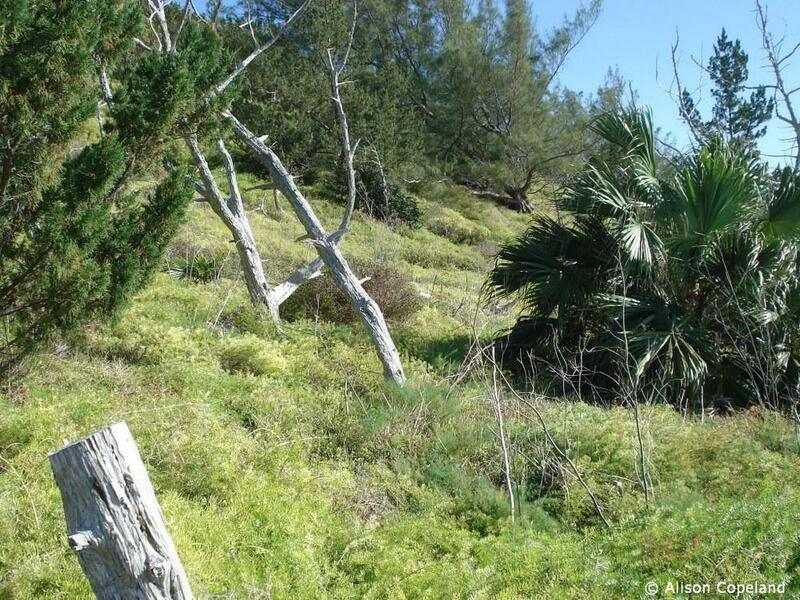 Forests made up only of Casuarina can be seen on many of Bermuda's small islands, like this one at Daniel's Head. Indian Laurels are also known as 'strangling figs' for their ability to grow on other trees, like this Bermuda Cedar on Parsons Lane. Indian Laurels can grow in cracks in walls, roofs and foundations. The roots enlarge the cracks and can cause serious damage to buildings. A fully grown Indian Laurel can reach 60 ft (18 m) tall. Brazil Pepper is native to Argentina, Brazil and Paraguay. This plant is often called 'Mexican Pepper' in Bermuda. Brazil Pepper trees can reach 43 ft (13 m) when fully grown, like this one in a garden in Pembroke. 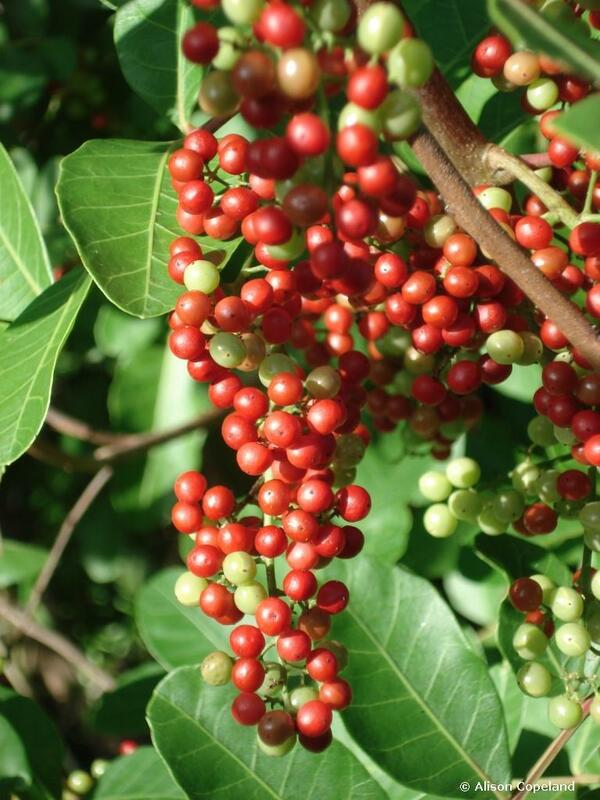 Only female Brazil Pepper trees produce berries, which ripen from November to February. The ripe fruit of the Brazil Pepper is a popular Christmas decoration in Bermuda. Brazil Pepper forms dense thickets that exclude native plants. Invasive Chinese Fan Palms resemble our endemic Bermuda Palmetto. The leafstem of the Chinese Fan Palm joins the leaf in a 'C-shape' when viewed from above (ie the top of the leaf). This is the key difference from the Bermuda Palmetto. Asparagus Fern covering a hillside in Hog Bay Park. This invasive grows densly along the ground and crowds out other plants. The leaves of the Surinam Cherry resemble the native White Stopper, however the leaves of the cherry are glossy, while the stopper is not. There are several types of wild asparagus in Bermuda, Asparagus Fern is the most common. In Bermuda Surinam Cherry flowers in March and April. Seaside Creeping Daisy (Wedelia trilobata) is an invasive ground covering vine. It is found particularly on the South Shore. Wedelia grows in dense mats that smother and kill native plants and prevent new plants from taking root. Lab Lab is an invasive vine with a three part leaf, white flowers and bean-like seed pods. It is found in pockets around Bermuda. The Kiskadee was introduced as a biological control for the anole lizard. It also eats fruit and is responsible for spreading the seeds of some invasive plants. The Red-eared Slider has invaded most of Bermuda's freshwater and brackish ponds. They are frequently dumped there by irresponsible pet owners. Red-eared sliders upset pond ecology by eating fish and invertebrates and destroying birds nests. Surinam Cherry forms a dense forest in the Blue Hole Park where it excludes almost all other trees. The marine toad is one of the worst invasive species in places like Australia, but although common in Bermuda they are not a serious threat to native wildlife. 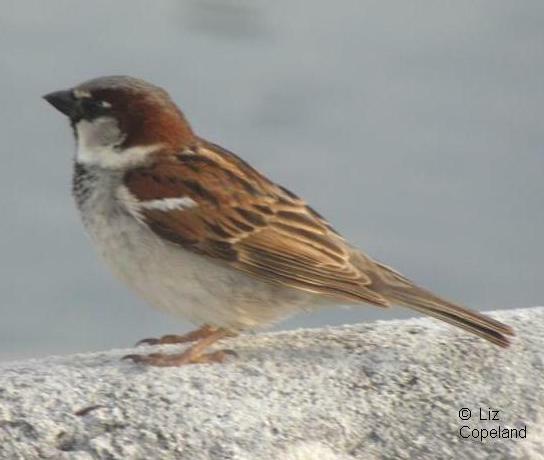 Pigeons are common in urban parts of Bermuda, as well as along the South Shore cliffs where they compete for nesting cavities with the native Longtail. Flocks of Pigeons can be seen along the South Shore and are also found around diary farms, like this one at Spittal Pond, where they eat the feed put out for the cows. Lionfish are native to the Indo-Pacific. The first one was recorded in Bermuda in 2000. Rats impact endemic plant populations by eating the fruit and seeds, like this one eating the fruit of a Bermuda Palmetto. The House Mouse (Mus musculus) is invasive in Bermuda. Mice arrived with the early settlers in the 1600's and have been impacting Bermudian habitats and species ever since. Starlings were introduced to North America from Europe. 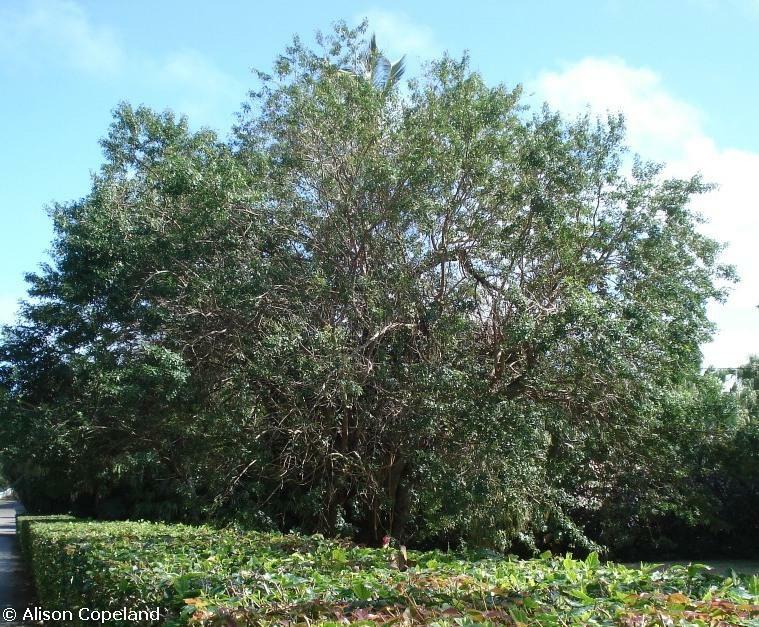 In Bermuda they are responsible for spreading the seeds of many invasive plants. 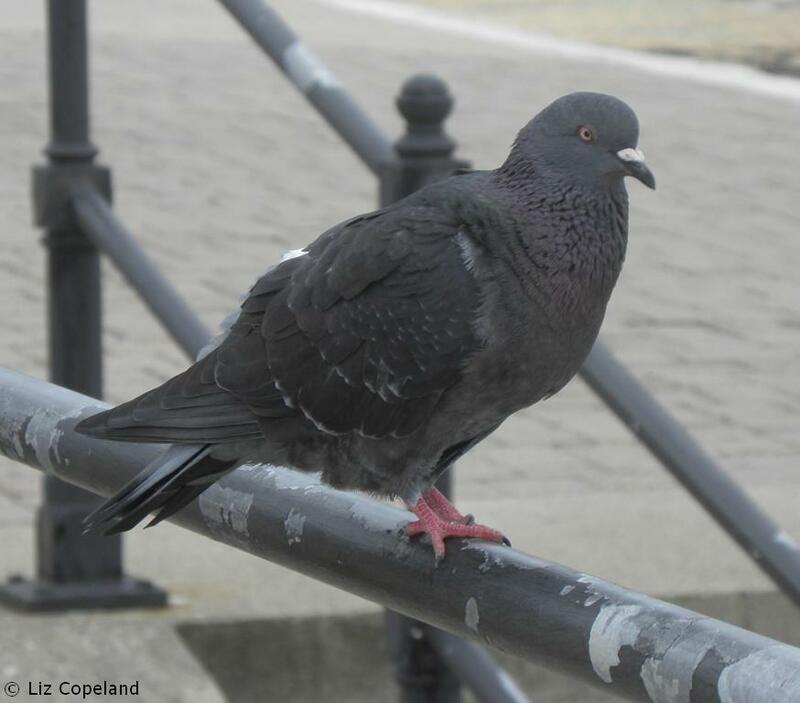 They are also a nuisance because they build nests in walls and buildings. The Rosy Wolf Snail (brown shell) was introduced to control the Milk Snail (white shell). The Rosy Wolf Snail or Rosy Euglandina (Euglandina rosea) is an introduced predatory snail that preys on other snails. It is a serious threat to the endemic Bermuda Land Snail. Water Hyacinth (Eichhornia crassipes) is an aquatic plant that is on the IUCN list of the world's top 100 invasive species. It forms dense mats at the water surface, choking other vegetation and blocking the sun from penetrating the water. In Bermuda it can be seen in freshwater wetlands such as Pembroke Canal. Ardisia, also called Jetberry or Marlberry was introduced as an ornamental shrub, but has since become invasive in wetlands. It gets its name from the bright pink berries which turn jet black when ripe. Ardisia has become a serious threat to native plants in Paget Marsh, where it grows densly in clearings along the ditch, under the mangroves and in the understory of the forest. The distinctinve bright pink leaf stems can be used to identify this shrub. Beach Naupaka has a round berry that is bright white when ripe. It is found in beach and sand dune habitats. Beach Naupaka is an invasive coastal plant that forms dense thickets that exclude native plants, like this one at Warwick Long Bay. 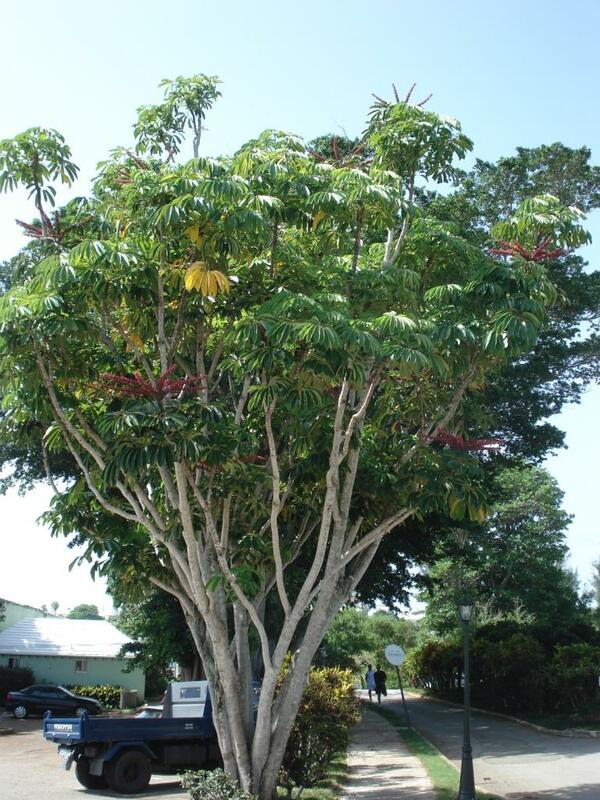 Queensland Umbrella Tree (Schefflera actinophylla formerly Brassaia actinophylla) is a fast growing, commonly planted garden tree in Bermuda. It has long stemmed leaf clusters and sprays of bright red berries that are spread by birds. Umbrella Trees will grow from cracks in walls, roofs and stonework. They are a nuisance and a threat to historic buildings, like this one growing from a wall at Fort Hamilton. Pride of India (Melia azedarach) is a large deciduous tree that produces purple flowers in spring and early summer followed by yellow berries which are poisonous. It has become invasive in Bermuda's woodlands and roadsides. The Department of Environment and Natural Resources leads the Government effort to manage certain pests and invasive plant species that have an impact on Bermuda’s delicate ecology. This includes the management of feral chickens, feral pigeons, crows, red eared sliders terrapins and rats (only in protected nature reserves). Our Terrestrial Conservation team focuses on invasive plant species management. The spread of highly invasive plant species is a serious threat to Bermuda's biodiversity, as these faster growing species push out our slower growing native and endemic species. Click on the image below to download the management plan for these invasive pest species.